The Bay of Plenty seen from Whakatane. The Whakatane River (foreground) is one of eight major rivers that empty into the bay. According to local Māori traditions, the Bay of Plenty was the landing point of several migration canoes that brought Māori settlers to New Zealand. These include the Mataatua, Nukutere, Tākitimu, Arawa and Tainui canoes. Many of the descendent iwi maintain their traditional homelands (rohe) in the region, including Te Whānau-ā-Apanui, Te Whakatōhea, Ngāi Tai, Ngāi Tūhoe, Ngāti Awa, Ngāti Tūwharetoa ki Kawerau, Te Arawa, Ngāi Te Rangi, Ngāti Ranginui and Ngāti Pūkenga. Early Māori settlement gave rise to many of the town and city names used today. The first recorded European contact came when James Cook sailed through the Bay of Plenty in 1769. Cook noted the abundance of food supplies, in comparison to Poverty Bay further back along the eastern coast of the North Island. Further reports of European contact are scarce prior to the arrival of missionary Samuel Marsden to the Tauranga area in 1820. Bay whaling stations operated in the bay during the 19th century. During the 1820s and 1830s, northern iwi including Ngā Puhi invaded the Bay of Plenty during their campaign throughout the North Island, fighting local Māori tribes in what became known as the Musket Wars. However, the 1830s and 1840s saw increased contact between Bay of Plenty Māori and Europeans through trade, although few Europeans settled in the region. Missionary activity in the region also increased during this time. In 1853, New Zealand was subdivided into provinces, with the Bay of Plenty incorporated into Auckland Province. Conflict returned to the Bay of Plenty during the 1860s with the New Zealand Land Wars. Initially this stemmed from Tauranga iwi supporting the Waikato iwi in their conflict with the government. In retaliation, British Crown and government-allied Māori forces attacked the Tauranga iwi, including at the famous Battle of Gate Pā in 1864. Further conflict with the government arose in 1865 when German missionary Carl Völkner and interpreter James Fulloon were killed by local Māori at Opotiki and Whakatane, respectively. The ensuing conflict resulted in the confiscation of considerable land from several Bay of Plenty iwi by the government. Confiscation of Māori land deprived local iwi of economic resources (among other things), and also provided land for expanding European settlement. The government established fortified positions, including at Tauranga, Whakatane and Opotiki. European settlers arrived throughout the latter half of the 19th century, establishing settlements in Katikati, Te Puke and the Rangitaiki area. In 1876, settlements were incorporated into counties following the nationwide dissolution of the provincial system. Initial settlements in the region struggled: the climate was ill-suited to sheep farming and the geography was inaccessible, further hindered by a lack of infrastructure. By the end of the century the population had started to dwindle. But after experimenting with different crops, settlers found success with dairy production. Dairy factories sprang up across the Bay of Plenty in the 1900s, with butter and cheese feeding economic prosperity throughout the early 20th century; local Māori continued to live on the fringe of this prosperity. Timber also became a major export in the 1950s, as kiwifruit did later. The present Bay of Plenty region was formed in 1989 after a nationwide review and shakeup of top-level local government in New Zealand. The new region incorporated the former counties of Tauranga, Rotorua, Whakatane and Opotiki. On 5 October 2011, the MV Rena ran aground on the Astrolabe Reef in the bay causing a large oil spill, described as New Zealand's worst ever environmental disaster. The region is subdivided into territorial authorities, which include the Western Bay of Plenty District, Tauranga City, Whakatane District, Kawerau District and Opotiki District, as well as parts of Rotorua District and the town of Rangitaiki in Taupo District. The Bay of Plenty Regional Council, which used the brand name Environment Bay of Plenty for a number of years, is the administrative body responsible for overseeing regional land use, environmental management and civil defence in the region. It also oversees local-tier governing councils for each of the territorial authorities. In 1989, Whakatane was selected as the seat for the regional council, as a compromise between the two dominant cities of Tauranga and Rotorua. Public health in New Zealand is broken into regions. The Bay of Plenty and Lakes district health boards have public health provided by Toi Te Ora - Public Health. The Bay of Plenty region covers 12,200 km² of land and 9,500 km² of coastal marine area. It extends along the eastern coast of the North Island, from the base of the Coromandel Peninsula in the west to Cape Runaway in the east. The region extends 12 nautical miles from the mainland coastline, and also extends from the coastlines of several islands in the bay, notably Mayor Island/Tuhua, Motiti Island, Whale Island and the active volcano of Whakaari/White Island. It extends inland to the sparsely populated forest lands around Rotorua and Murupara. The geographical bay is defined by 259 km of open coastline used for economic, recreational and cultural purposes. The coastline from Waihi Beach in the west to Opape is defined as sandy coast, while the coast from Opape to Cape Runaway is rocky shore. Sizeable harbours are located at Tauranga, Whakatane and Ohiwa. Major estuaries include Maketu, Little Waihi, Whakatane, Waiotahe and Waioeka/Otara. Eight major rivers empty into the bay from inland catchments, including the Wairoa, Kaituna, Tarawera, Rangitaiki, Whakatane, Waioeka, Motu and Raukokore rivers. 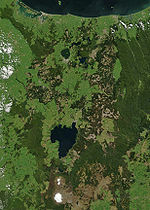 The region has more than 200 km² of lakes, known as the Lakes of Rotorua. Much of the central part of the region lies within the Taupo Volcanic Zone, which extends from the centre of the North Island northwards to Whakaari/White Island. Volcanic mountains and lakes, geothermal areas and geological fault lines all dot the landscape. The geothermal region around Rotorua is a major tourist site, while many hot springs in the region are used as swimming areas. The geothermal field near Kawerau is the site of a geothermal power plant that will reportedly meet up to one third of residential and industrial electricity demand in the Eastern Bay of Plenty. Whakaari/White Island, the site of a former sulfur-mining operation, is an active volcanic island popular with tourists. The eruption of Mount Tarawera in 1886 and the 1987 Edgecumbe earthquake were two disasters related to geological activity in the volcanic plateau. Prominent mountains in the region include Mount Maunganui, Mount Tarawera and Mount Edgecumbe/Putauaki, which also have cultural significance to local Māori. The Kaimai and Mamaku mountain ranges lie at the western border of the region. Swamp land was formerly concentrated around a number of rivers, but much of this was dredged in the early part of the 20th century to increase land for settlement and other uses. Large native and foreign (planted) forest areas are found in the inland parts of the region. The Kaingaroa Forest is the world's largest planted forest, comprising radiata pine mainly used for timber. The bay contains numerous islands, notably the active volcano Whakaari / White Island, which lies 50 kilometres from the coast in the eastern bay. Other large islands include (from west to east) Matakana Island, Mayor Island / Tuhua, Motiti Island, and Moutohora Island. The Waimangu Geyser – to be seen 1900–1904 – erupted frequently, was the most powerful geyser of the world and killed 4 people in 1903. Population density map of the Bay of Plenty at the 2006 Census. Red = High, Green = Low. In the 2006 Census, the total resident population of the Bay of Plenty region was 257,379, an increase of 7.5% from 2001. The Bay of Plenty is the fifth-most populous region in New Zealand, accounting for 6.4% of the national population. The regional population is projected to increase to 277,900 by the year 2011. The median age in the Bay of Plenty was 37.2 years; 23.0% of the population were under 15 years of age, while 14.8% of people were aged 65 years or over. The male-to-female ratio was 0.94. The coast is dotted with several sizable settlements, the largest of which is the conurbation of the city of Tauranga and its neighbour Mount Maunganui in the west. The town of Whakatane is located in the centre of the coast. Other towns of note include Waihi Beach, Katikati, Maketu, Pukehina Beach and Opotiki. Most of the population along the coast is concentrated in the western and central parts of the shore; the eastern part is sparsely populated hill country. In the 2006 Census, the Bay of Plenty had an estimated resident population of 257,379, making it the fifth-most populous region in New Zealand. It also has the third-highest regional population density in New Zealand, with only the 11th-largest land area. The major population centres are Tauranga, Rotorua and Whakatane. The Bay of Plenty is one of the fastest growing regions in New Zealand: the regional population increased by 7.5% between 2001 and 2006, with significant growth along the coastal and western parts, and is projected to increase to 277,900 by the year 2011. Significant horticultural, forestry and tourism industries are well established in the region. However, the Bay of Plenty is the third-most economically deprived region in New Zealand, with the eastern districts being among the least economically developed in the country. However, in 2011 Business & Economic Research Limited (BERL) identified the Bay of Plenty as one of the top performing regions in economic development, ranking second behind Auckland. It had the highest employment and GDP growth for 2011 and had the fastest growing medium term GDP. 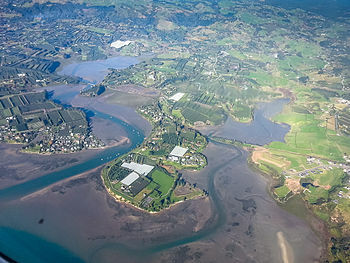 Tauranga, the region's largest commercial centre, was named New Zealand's top city for economic performance for the 2011 year. 67.1% of the resident population in the Bay of Plenty identified with the European ethnic group, while 27.5% of people identified themselves as Māori. This compared with 67.6% of the national population identifying themselves as ethnic European and 14.6% identifying themselves as Māori. Other ethnic groups were under-represented in the region: 14.9% of the regional population was born overseas, compared with 22.9% nationally. English is the most widely spoken language. Te Reo Māori is the most common minority language, spoken by 9.6% of the population, compared with 4.1% nationally. The Bay of Plenty has a temperate, maritime climate, with warm, humid summers and mild winters. It is one of the warmest regions in New Zealand, particularly along the coastline, and most areas experience at least 2,200 hours of sunshine per annum. Average daily maximum temperatures range from 9–16 °C in winter to 22–26 °C in summer. Rainfall occurs more frequently in winter than in summer, but tropical storms in summer and autumn can produce heavy rain with high winds. Central parts of the region can receive up to 2000 mm of rainfall annually, while the eastern and western areas can receive up to 4000 mm. The sub-national GDP of the Bay of Plenty region was estimated at US$6.689 billion in 2003, 5% of New Zealand's national GDP. The Port of Tauranga is the largest port in the country by cargo volume. Agriculture, natural resources and tourism are the major industries. Most (96 per cent) of the region is defined as 'rural', with 22% of land usage representing farm land and 38% representing nature reserve land. The most common agricultural land uses are horticulture, dairy, grazing and sheep farming. Notable horticultural crops include kiwifruit, apples and avocadoes. The region also has an abundance of coastal, forestry and geothermal resources. Forestry emerged as a vital industry in the 1950s, with radiata pine being planted during the early 20th century. Forestry is commercially planted and managed, mostly using planted foreign tree species, and timber is sent to the Port of Tauranga for export. Geothermal activity is a source of tourism, and geothermal energy is emerging as a major regional source of electricity. Tourism is the other notable industry, accounting for 15% of the region's GDP from March 2000 to 2004. Overall economic growth in the Bay of Plenty averaged 2.1% between March 2000 and 2004, compared with the national rate of 3.5%, although per capita real GDP growth in the five years to March 2003 matched the national growth rate at an averaged 2.3%. In the 2006 Census, the median annual income was $22,600, below the national median of $24,400. Further, 45.4% of people aged 15 years or older earned an annual income of less than $20,000, compared with 43.2% of people nationally. Unemployment was at 6.1% of people 15 years or older, compared with 5.1% nationally. The Bay of Plenty is a popular holiday destination due to the warm and sunny summer climate and public beaches. The Bay of Plenty received over 645,000 tourists in 2003, equivalent to one in three visitors to New Zealand coming to the region. Rotorua is a popular destination for international visitors, in particular the surrounding geothermal areas and Māori cultural centres. Tauranga is a popular domestic tourism destination, and also becoming popular internationally. Whale watching has become a popular attraction as the number of whales such as blue whales and humpback whales migrating into bay waters began to recover. The Bay of Plenty has 227 km of rail network and 4,460 km of roads. The main rail line in the region is the East Coast Main Trunk Railway, which extends from Hamilton in the Waikato region to Kawerau via Tauranga, with the Murupara Branch Railway extending the Kawerau terminus to Murupara, and the Mount Maunganui Branch connecting the Mount Maunganui terminus with the East Coast Main Trunk. Rail networks in the region are used exclusively for freight. The hub of regional economic activity is the Port of Tauranga, with well-established rail and road connections to other parts of the region. Three commercial airports also operate in the Bay of Plenty: Tauranga Airport, Rotorua Airport and Whakatane Airport. Car travel remains the dominant form of transport in the region. In 2002, the number of vehicles owned in the region was 189,000, with an average of 1.51 vehicles per household. Public transport bus services exist only in Tauranga and Rotorua. Significant growth in the Western Bay of Plenty District has seen increased strain on road infrastructure, particularly with increasing traffic congestion in Tauranga. Due to this growth, a new highway network is being planned and constructed in Tauranga to join with its current network spanning on the western side of the city. The New Zealand Transport Agency, in conjunction with Environment Bay of Plenty, Tauranga City and the Western Bay of Plenty District Councils, is planning to build an Eastern Motorway bypassing Te Puke, a Western Motorway bypassing Omokoroa and a smaller Southern Motorway. The Bay of Plenty is represented in several domestic sporting competitions. The Bay of Plenty Rugby Union oversees the Bay of Plenty Steamers, who play in the Mitre10 Cup. The Steamers are also a feeder club for the Chiefs who play in the Super Rugby competition. The Waikato/Bay of Plenty Magic compete in the ANZ Championship in netball, having previously played in the National Bank Cup. Bay of Plenty also makes up a part of the Northern Districts cricket region and the Midlands hockey region. ^ a b c d e McKinnon, Malcolm (27 September 2007). "Bay of Plenty". Te Ara – the Encyclopedia of New Zealand. Archived from the original on 20 March 2008. Retrieved 25 February 2008. ^ "Our History". Tourism Bay of Plenty. Retrieved 25 February 2008. ^ "Bay of Plenty History". New Zealand Tourism Guide. Retrieved 10 October 2011. ^ "Tauranga incident response update". Maritime New Zealand. 5 October 2011. Archived from the original on 18 October 2011. Retrieved 2011-10-13. ^ "'Worst ever environmental disaster'". New Zealand Herald. 11 October 2011. Retrieved 11 October 2011. ^ "Bay of Plenty - New Zealand Travel". newzealandtravel.org. ^ a b "Our Region". Environment Bay of Plenty. Archived from the original on 18 February 2008. Retrieved 3 March 2008. ^ "Our Coast". Environment Bay of Plenty. Archived from the original on 16 January 2008. Retrieved 3 March 2008. ^ "Mighty River Power media release: Generation Equipment Arriving at Kawerau". 18 October 2007. Archived from the original on 9 October 2008. Retrieved 2008-06-23. ^ a b c d Environment Bay of Plenty (September 2004). "Bay of Plenty Regional Land Transport Strategy" (PDF). pp. 15–32. Archived from the original (PDF) on 11 April 2008. Retrieved 28 February 2008. ^ "Birthplace (detailed), for the census usually resident population count, 2001, 2006, and 2013 (RC, TA) – NZ.Stat". Statistics New Zealand. Retrieved 1 February 2016. ^ a b Mullan, Brett; Tait, Andrew; Thompson, Craig (21 September 2007). "Regional Climate". Te Ara – the Encyclopedia of New Zealand. Archived from the original on 11 April 2008. Retrieved 7 March 2008. ^ "Climate Change". Environment Bay of Plenty. Archived from the original on 13 February 2008. Retrieved 3 March 2008. ^ a b c New Zealand Institute of Economic Research (1 November 2005). "Bay of Plenty Economic Profile". Regional Economic Performance: Final Report. New Zealand Ministry of Economic Development. Archived from the original on 4 April 2008. Retrieved 28 February 2008. ^ "Integrated Transport Strategy for Tauranga" (PDF). Tauranga City Council. Archived from the original (PDF) on 15 October 2008. Retrieved 21 April 2008. ^ "Radio FM - Bay of Plenty - Radio Stations NZ - Easy Listening Rock Hits". radiofm.co.nz. 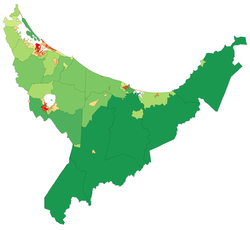 Wikimedia Commons has media related to Bay of Plenty Region.